Send your sweet wishes for a Happy Easter to your loved ones with this delightful surprise! Each large cookie is hand decorated and personalized with your choice of options, making this Easter gift box the best treat your loved ones will receive this year. Freshly baked large sugar cookies are made with the finest of ingredients and custom decorated within minutes of leaving our ovens. Using delicate techniques we hand decorated every detail of your cookies from the bunny cookies ears to his little paws. We personalize the heart shaped cookie with a name of your choice and the message "Some Bunny Loves You" making this an unforgettable and delicious Easter treat. 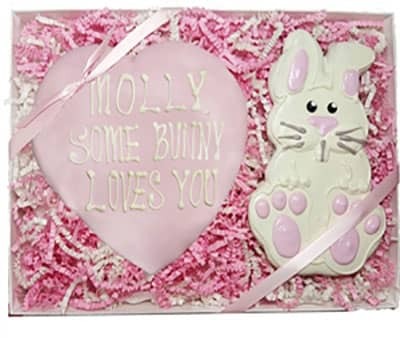 Your custom cookies will arrive in a festively packed Easter Box with a matching ribbon. Shipping Method and Delivery Date are chosen during checkout process. Same Day Delivery is not available, but a great alternative is an immediate emailed Gift Card.